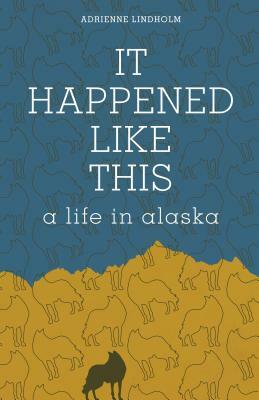 It Happened Like This is, on the surface, a memoir about what it means to live and love in one of the wildest places on the planet. But the love described is not a simple one; it's a gritty, sometimes devastating, often blood-pumping kind of feeling played out in the rugged Alaska wilderness. In an authentic and honest voice, writer Adrienne Lindholm recounts her move to Alaska as a young woman eager to begin her career in environmental and wildlife studies. She finds herself initially out of her depth among her peers, many of whom are also "Outsiders," new to the state, but who seem more experienced, more confident. Eventually she finds her way, immersing herself in the rigors of wilderness adventures and building a community of outdoorsy friends to sustain her. Soon she falls in love with JT and gradually, at times painfully, they build a life together and decide to start a family amidst the wild. Adrienne celebrates the many ways in which Alaska, and her outdoor adventures there, inspired self-discovery, as well as revealing her difficult and intimate journey into motherhood. Her love story encompasses the outline of massive mountains on the horizon, viewed for the first time; a caribou moving through an alder forest; the effort to climb a glaciated peak; and the peace that settles when contemplating a quiet Arctic lake. At times, her love--for JT, but also for nature and life--also feels savage, like when she charges onto a glacier alone, or when she shoots, kills, and skins her first animal.